Kongar-ool Ondar was born in 1962 and began throat singing as a child. In 1985, after serving in the Soviet Navy and receiving a degree from the Kyzyl Pedagogical Institute, he formed the Tuva Ensemble, which toured in Tuva and neighboring Soviet republics. In the early 1990s, he won the UNESCO-sponsored International Festival of Throat Singing. 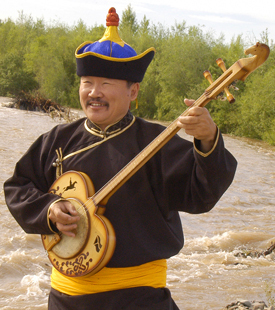 By 1992 he had toured throughout Europe and was awarded the title of People's Xoomeizhi (Throat Singer) of Tuva. He has performed with countless musicians in countries all over the world. In 1995, he hosted American blues musician Paul Pena, whom he had invited to Tuva to compete in the throat singing competition. The Oscar-nominated documentary Genghis Blues chronicles this adventure and prominently features Kongar-ool. Kongar-ool was also the first artistic director of Alash, and he accompanied the group on their first tour of the United States in 2006. He was a member of the Tuvan parliament and an honored Artist of the Russian Federation. He died of a brain hemorrhage on July 25, 2013 in Kyzyl, according to his obituary.